It was no shock when Dwight Howard opted to test free agency waters in the summer, rather than re-signing with the Houston Rockets. After three years of issues in Houston, Dwight was on the move again, hoping that a change of scenery would revive his career once and for all. So the 6’11 center decided to return to his home, Atlanta. The Hawks lost their starting center Al Horford in free agency to the Boston Celtics. In need of a new big man, they turned to Howard who was more than happy to accept a 3-year, $70.5 million contract, which is likely to be his final big contract in the league. Howard was seen tearing up in his introductory press conference, emphasizing his pride and passion for his hometown team. He doesn’t want any off-court or locker room issues this time around. It’s solely about basketball for him. The 30-year old returns to the Eastern Conference for the first time since leaving the Orlando Magic. Although a title continues to elude him, Howard is hoping that a new environment could be the key to bringing him back to his very best. There is no doubt when Howard is playing his best basketball, his team can beat anyone. Howard isn’t the only star on this team either. Paul Millsap is the leader of the team, and Howard is his new running partner. Although Millsap will never be an NBA superstar, he certainly doesn’t gain as much media credit as he deserves. The former second round pick has developed into one of the most consistent players in the NBA, averaging 17 points and 9 rebounds last term, along with 3 assists. He has been an Eastern Conference all-star for the past three seasons. Millsap led the Hawks to the first seed in the Eastern Conference in the 2014-2015 season, along with Al Horford, Jeff Teague and Kyle Korver, before losing to the Cleveland Cavaliers in the Eastern Conference Finals. Last season the Cavs came back to haunt them in the playoffs once again, beating the Hawks in the second round before going on to win it all. Although Al Horford is now in Boston, and Jeff Teague has moved to the Indiana Pacers, the Atlanta Hawks will once again be a strong Eastern Conference team, and they have started in the perfect way. 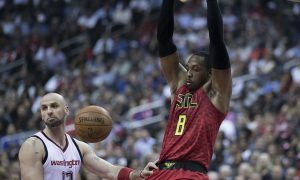 The Hawks have won their opening three regular season games, topping the Washington Wizards, the Philadelphia 76ers and the Sacramento Kings. Howard had a strong performance in his debut, scoring 11 points and grabbing 19 rebounds in the win against Washington. His 3 blocks also shows signs of the old Dwight’s ability on the defensive end. He then went on to have a quiet game in Philadelphia, scoring just 2 points and 7 rebounds in the win. He did once again block 3 shots, which the Hawks fans have to be happy with from his 19 minutes of action. In last nights win against Sacramento, Howard returned to his best with 18 points, 11 rebounds and 4 blocks in front of the home crowd at Phillips Arena. He looks to be enjoying his basketball in front of the Hawks fans, and they will be more than happy with his contributions early on. With three early wins in the books for Atlanta, it looks quite clear what their ambitions are for the season ahead, and that is to put up a fight against the Cleveland Cavaliers, who the media believe are certain to return to the finals for a third straight season. Atlanta take on the young LA Lakers tomorrow, and will be looking to continue their perfect start to the season. Can Dwight Howard return to his very best and lead this team to the Eastern Conference to take on Lebron James and the Cavs? If we have learnt anything from the first three games, Howard looks to be a good fit on his return to Atlanta. Let’s hope it continues. NBA free agency 2016 – Who’s on offer?